Spinal stenosis is a back disorder that takes place when there is pressure on the nerve roots present in the spine. The word is derived from Greek word ‘stenosis’ that means ‘choking’. 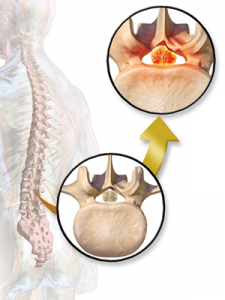 There are of two types: cervical and lumbar spinal stenosis. Amongst the two types, lumbar spinal is more commonly found than cervical spinal stenosis but it is cervical spinal stenosis that is more dangerous as it puts pressure directly on the spinal cord. Let us take a brief look at the two types of this disorder they include. In this type of spinal the nerve roots in the lower back are compressed which leads to the patient suffering from sciatica. Because of sciatica the patient suffers from pain in the back as well as weakness and numbness in the lower back area. The person also suffers from radiating pain and tingling sensation in buttocks and legs. This is a serious disorder that leads to the compression of the spinal cord. If the person is suffering from cervical spinal stenosis than he can suffer from serious body weakness that can even lead to paralysis if the condition is left untreated too long. Diagnosis is usually done with the help of imaging diagnosis tests like MRI scan as well as CT scan with myelogram where X-ray dye is used in the spinal sack fluid. Usually doctors prefer using conservative treatment options like exercises, physical therapy, medication, epidural injections, acupuncture as well as chiropractic. Surgery is only considered when the above mentioned options are unable to relieve the problems of the patient.